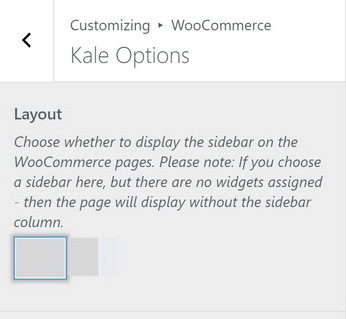 In Kale, there are specific widget areas designated for content related to WooCommerce shops. In order to show these widget areas, you need to display the sidebar on the WooCommerce pages. Go to Appearance > Customizer > WooCommerce > Kale Options and toggle the sidebar. If you choose a sidebar here, but there are no widgets assigned - then the page will display without the sidebar column. More on the WooCommerce widget areas can be found here.